Need Quick Cash? Do This! Do you miss out on money-making opportunities that are right in front of you? Learn some simple, effective marketing techniques to jump-start your income while you’re implementing long-term strategies. Quick Cash Strategy #1. 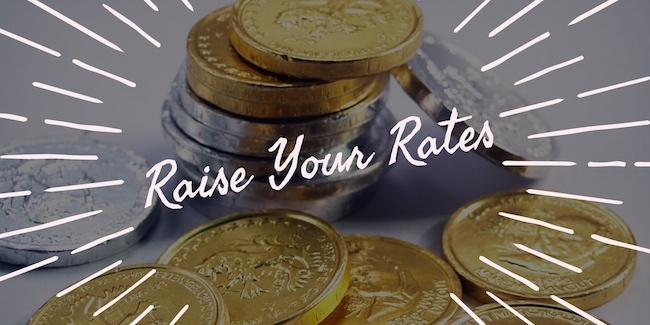 Raise Your Rates! Here is an obvious way to make some extra money quickly – simply increase your fees. Don’t worry about losing clients. Just don’t do it frequently and be careful not to spring the fee increase on your clients unannounced! Start announcing 4-6 weeks in advance. Put it in writing via email, postal mail, flyer and/or phone message to inform your entire client base of the upcoming change in your fees. Give everyone at least 2 reminders of the fee change. With each notice, include something positive to ease their pocketbook pain – a bonus, gift or amenity – something that supports your work with added value for the client, with little cost or time for you. In your announcements, lead with the bonus offer, followed by the fee increase. Now… here’s where the fun begins for quick money! With the announcement, offer clients a treatment package – a chance to prepay for a series of sessions at the current fee before your rates go up. Don’t give them much time to “think about it” – a limited-time offer creates a sense of urgency and gets people to act quickly. Use an expiration date on the package so they don’t take months or years to use it up. Use this prepay strategy only if they buy a series, not for single sessions. Make sure you you’re set up to accept credit cards and/or online payments, making it easier for clients to take advantage of your generous offer. This is the quickest and most obvious way to make more money quickly. The first time I used this strategy, I made an extra $4700 in one week, as my clients scrambled to take advantage of the special limited-time offer to prepay for as many sessions as they wanted! Remember – this is a temporary, short-term tactic and should not be used too freequently in your business. The idea is to leverage some quick income into more marketing for faster business growth. You will be amazed at how quickly you get referrals and new clients using this simple strategy. It takes a bit of work upfront, but you’ll be rewarded for your efforts – all the way to the bank! This entry was posted in Quick-Money Strategies, Raise Rates and tagged quick cash strategies by The Prosperous Practice.Bookmark the permalink. Get Movin’ with Mothers’ Day Marketing!